A classic style apothecary jar filled with hand made treats will bring back warm memories of childhood days. Offer your guests a thoughtful favor when you fill these classic jars with cookies, candy, treats, honey, fudge, spices, baths salts or other delightful treats of your choice. 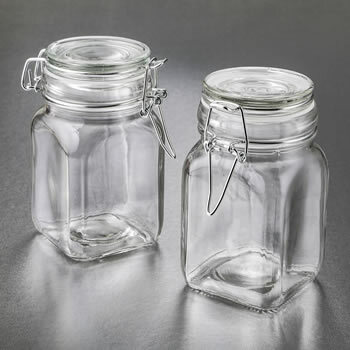 The large jars are made from glass and have a 10oz capacity. The jar has a hinged top with a rubber gasket and a metal closure for an airtight seal that will keep the contents fresh. Apothecary jars come bulk packed in bubble bag egg crate box. Size 4.75" tall x 2.5" x 2.5"